A fruitful 2018-2019, the Parents and Pupil’s Recognition Day is a memorable event of recognizing the hard work of the parents, pupils, faculty and staff. 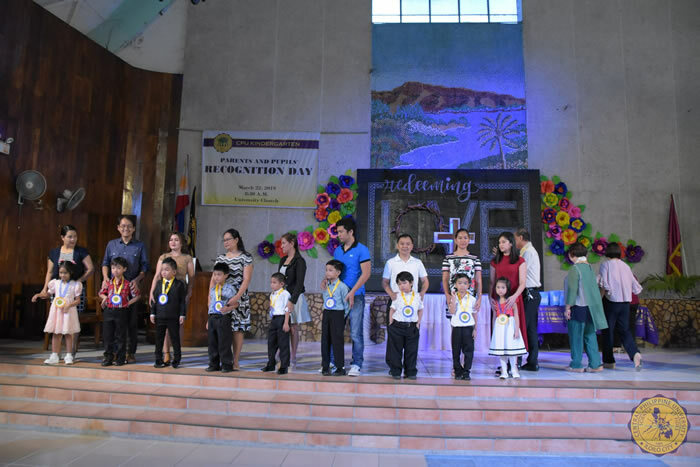 Celebrating God’s faithfulness and recognizing the hard work of our parents and teachers – the Central Philippine University Kindergarten Department held their Parents and Pupil’s Recognition Day at the University Church on March 22, 2019. The opening prayer was led by Marian Elaine Rose A. Quijano, K2, Mercy Pupil while the Pambansang Awit was conducted by Ms. Joyce Guides, K2 Gentleness Parent. The inspirational message was given by Dr. Carmen Pama-Santos, Basic Education Consultant, Central Philippine University. In her message Dr. Santos encouraged the parents to take heart and trust in the promises of God as their children move forward into the elementary level. She also highlighted the university’s dedication in providing the best methodology and instruction for Kindergarten education. In recognition of their achievements, the students received their awards from Dr. Rio and Dr. Santos assisted by Prof. Hannah C. Siosan, CPU Kindergarten Principal. The closing remarks was given by Prof. Siosan. It was then followed by the prayer and benediction by Pastor Jec Dan S. Borlado, Nursery Charity Parent and the singing of the Alma Mater Song by Mrs. Vina Luz P. Lopez, faculty.